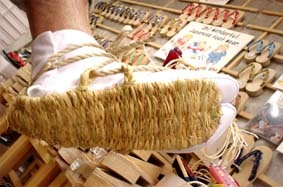 Traditional Japanese straw sandals "waraji"
Wearing wraji is known to be very beneficial for the health of your feet because of the way they help the arch of the foot to form, or shape, properly. This is why waraji-wearing Japanese have very few problems with flat feet. In addition, waraji wearing makes your legs and feet stronger because of the way you must use your muscles when walking. 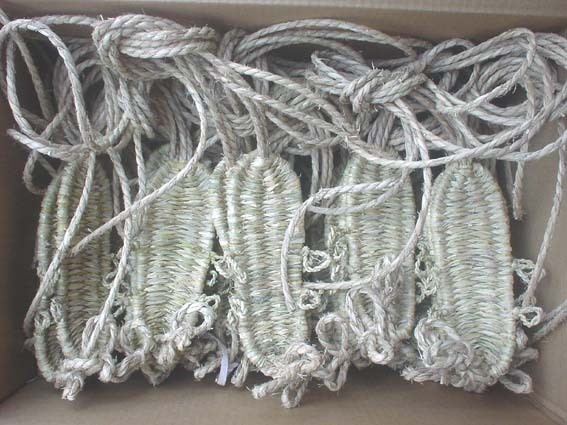 They are now used for training in martial arts, for rehabilitation training, for training in mountain climbing, costume play, festival and are used often for teaching in school. it takes an advance order. The big toe and little toe stick out the edge of waraji. This is true Japanese waraji style traditionally. Japanese don't care so much the "stick out". However, people from other countries have different opinions about how to wear the waraji. I think there are no hard rules about how to wear the waraji. Any style and fit is ok. Whatever the person wants to be able to enjoy wearing them. What are the waraji used for? Have you ever worn waraji? If you don't know much about size, please take a look at the page "How to wear geta". 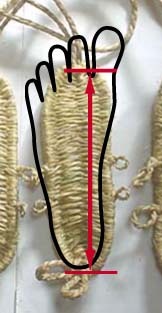 A traditional rough straw sandal with thong passing between the big and second toes, tied onto the foot with straw straps which pass through a series of loops on the sides of the sole. 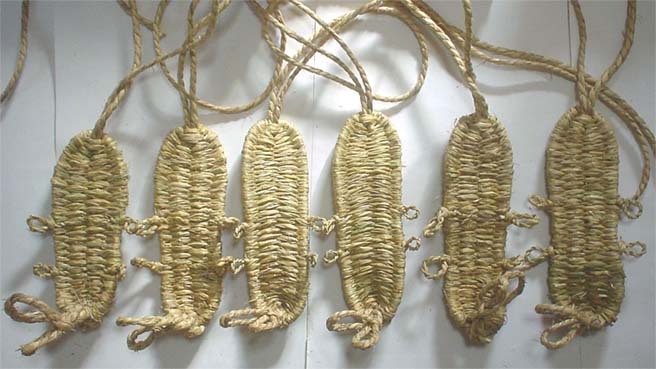 Waraji were used throughout Japan and worn when taking long journeys on foot. Their manufacture was one of the evening's tasks in a farm household; in many refions making waraji was the first task of the New Year.